Are you interested in becoming our reseller partner? Join our reseller program! 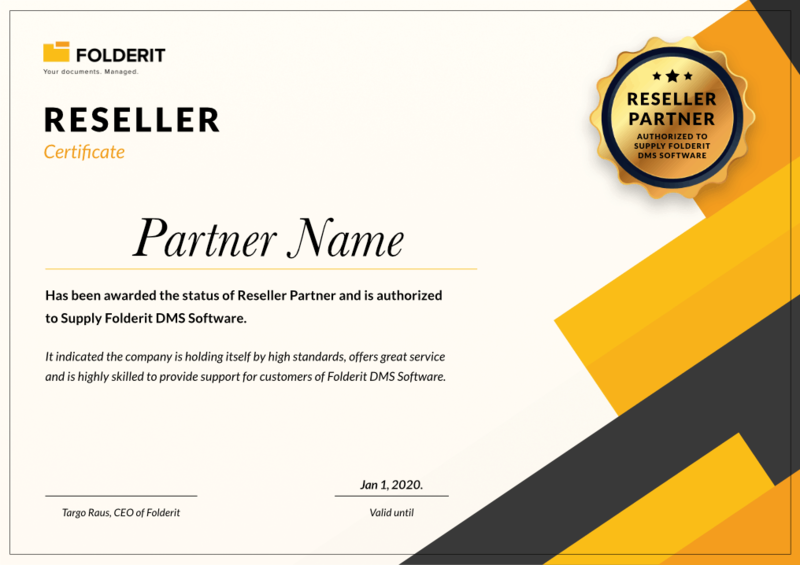 Folderit DMS, the winner of the review test of more than 500 document management systems; it’s an easy sell. It’s been proven to be the easiest to use, it’s secure, affordable and is exactly what most organizations are looking for! Folderit is the perfect DMS for small and medium businesses in any field of operation; it’s also great for other organizations like NPOs, NGOs, clubs, unions, condominium associations, churches, etc. All our reseller program partners (resellers) are in the B2B market, mostly in digitalization, digital archiving, IT consulting, telecommunications, office supplies or financial business. Both referral resellers and value-added resellers (VARs) are welcome to contact us as we have a lot to offer for both. If you feel your company can be our DMS reseller partner in any given region, fill in the form below! Established companies with a large client-base might be eligible for territorial reseller exclusivity. Value-added resellers can invoice their customers directly! In its simplest form, we will provide you with a registration link that your customers can use to register — that way, we know which customers to associate with you. Value-added resellers are able to invoice their customers directly. Do you provide a reseller dashboard to see who has signed up through my efforts? Yes. You can see the registered users and their contacts, when they were last active and other essential information. Is it possible to integrate with our own payment gateways and/or products? Absolutely, if you have a lot of customers, and you need to offer one coherent solution packaging in Folderit with your own offerings, we can offer a customized cooperation model. In that case the billing can be handled by the reseller and instead of invoicing us, we would invoice the partner (70% of the sale) for the accounts they have activated for their clients. Which plans can I sell? All Folderit monthly and yearly plans (Bronze, Silver, Gold, Platinum) are eligible for resale. Do my customers get a discount on standard Folderit pricing? Depending on the size of your customer list, we can offer them up to 10% discount on all our plans. You can always give discounts within the range of the reseller fee that we provide to you as well (30%). For example, you can sell Folderit solutions for -10% of our list price and then keep the 20% that’s left of your fee. How many subscriptions do I have to sell to start earning? You will receive your fee from every sale, starting from the very first sale you make. How often do you make payments to resellers? Usually once a month, but this depends on our agreement with the reseller and the sales volume. What kind of support do you offer to partner program resellers and affiliates? We offer technical and marketing support; see the complete list above.